R. Bruce Fickel, D.D. 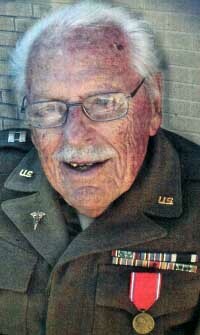 S., “Doc” as he was known to the Berthoud community, died on March 9, 2011, just three weeks prior to his 99th birthday. Doc was born in Edina, Missouri, the son of Lee A. and Charlotte Louise Harvey Fickel. He attended the University of Missouri for two years, after which he was employed as a social worker in the Knox County Welfare Department. He then enrolled in and was graduated from Washington University Dental School in 1941. That same year he opened his dental practice in Berthoud where he practiced for thirty years. On May 2, 1942 he married Helen Frances McCarty, M.D. In June of 1943 he enlisted in the United States Army and served in the European Theater of War from 1944 until January of 1946 when he was honorably discharged as a Captain. Doc served as the secretary of the Berthoud School Board from 1949 until 1955. He was the president of the Larimer County Dental Society from 1954 until 1955. In 1959 he developed the twenty-two acres of housing around Robert’s Lake and Bruce Drive in Berthoud which were probably serendipitously his first and second names. From 1959 to 1987 he served as a director of the Longmont National Bank where he took the opportunity to learn how wealth was secured, saved and squandered . Doc built the Grandview Nursing Home in 1960 and was its administrator for two years. He spent several of the last years of his life in one of the rooms that he had built and is now known as the Berthoud Living Center. His residential development career continued with the construction of the Fickel Farm Subdivision at the southeast side of Berthoud. Doc’s interest in construction was not strictly limited to the development of land. He personally built the house behind his dental office over a period of four years, working on it evenings and Saturdays. When he was asked how the semi-permanent construction project was going he said that it was a pleasure cutting and pounding on something that didn’t complain. He built an addition to the Berthoud Public Library in 1964 which was later converted into the chambers for the Berthoud board of trustees. Doc and Helen replaced that original library with the new Berthoud Library which they donated to the Town. His interest in politics extended from being a Larimer County republican committee- man and representative to the state assembly to serving as Berthoud’s mayor for eight years. While serving as mayor, with no apparent concerns as to issues of nepotism, his son, R.B. Fickel II served as the Town’s attorney, his nephew John McCarty served as the Town’s civil engineer and his nephew, Dr. David McCarty served as the Town’s referral physician. During that same time period he developed Fickel Park, in which two of his larger bronze sculptures are displayed. His involvement in the First Presbyterian Church of Berthoud allowed him to have the opportunity to hold the offices of Elder, Trustee and Deacon at various times from 1949 until 1989. He was the Worshipful Master of the Berthoud Masonic Lodge from 1984 until 1986 and received his fifty-year membership recognition at a special Masonic dinner. In 1989 Doc and Helen were selected by Channel 9 for the “9 Who Cares Award.” They were honored at a reception in Denver as the Pair-a-Docs. Helen died on December 25, 2005. As a lifelong member of the Berthoud Area Chamber of Commerce, Doc received the Citizen of the Year Award three times. Collectively, these awards precipitated the creation of the annual Doc Fickel Award by the Chamber for philanthropic acts in the Berthoud community. Doc gave the McCarty-Fickel Family home to the Berthoud Historical Society in 1998 and donated funds to the Community Foundation Serving Northern Colorado to support its operation as a museum and meeting facility. Knowing how much his patients enjoyed having their teeth filled and extracted he “encouraged”, and the Society acquiesced, in the display his dental chair and equipment in a darker cavity of the home’s basement. Memorial services will be held Tuesday, 10:00 a.m. at First Presbyterian Church of Berthoud. At the age of 98, Doc’s project for 2010 and 2011 was to assist with the purchase of a new organ for the First Presbyterian Church. The family would ask that, in lieu of flowers, any remembrances be directed to the purchase of the church’s organ. The mailing address for the First Presbyterian Church is, Post Office Box 1290, Berthoud, Colorado 80513.